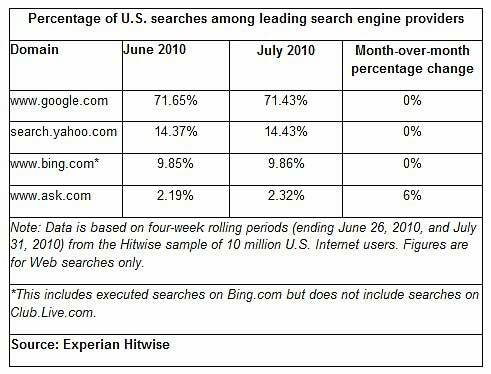 Google continued to dominate search in July, accounting for 71.43% of all US searches conducted in the four weeks ended August 1, 2010, while Ask's share of searches reached 2.32%, up 6% from June, according to Experian Hitwise data. Yahoo and Bing received 14.43% and 9.86%, respectively, of US searches in July. The remaining 70 search engines in the Hitwise Search Engine Analysis Tool accounted for 1.94% of US searches.